Join the Perran Yarns Team! 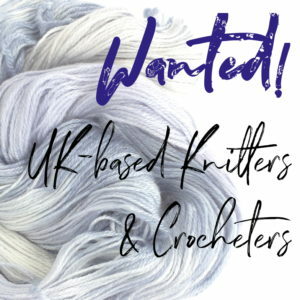 We’re on the look-out for enthusiastic UK-based knitters and crocheters to join our Team! Basically I don’t have anywhere near enough time to knit all the samples of my patterns that I’d like, and wear and tear on my thumb joint currently means that I can’t crochet without pain. First we’ll agree on a pattern, yarn, & timescale, which I’ll then post to you. You’ll make it in the timescale we’ve agreed and post it back to me in the pre-paid box. Finally you can choose your Perran Yarn which I’ll post to you as your reward! If this sounds like something you’d like to do, then just click on the image above to fill in your details and answer a couple of questions, then I’ll get back to you.